The Landwind X7, shown, has broad fenders, recessed door panels and a sloping roof similar to the Range Rover Evoque. Jaguar Land Rover will not take action against Jiangling Motors over the Chinese automaker's Landwind X7, which the UK automaker says closely resembles the Range Rover Evoque SUV. JLR had said it would take "appropriate action" against Jiangling when the Landwind X7 was unveiled at the Guangzhou auto show in China in November. On Monday at the Shanghai show, JLR chief executive Ralf Speth renewed his criticism of Jiangling but said his company cannot prevent the SUV from going on sale. "I really regret that all of a sudden, copy-and-paste is coming up again," Speth told reporters. "There are no laws, there's nothing to protect us, so we have to take it as it is." 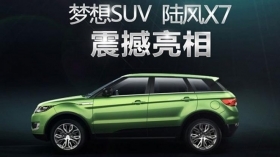 The Landwind X7 will sell in China for about one-third of the price of the Evoque. It has broad fenders, recessed door panels and a sloping roof similar to the Evoque. JLR opened a production plant outside Shanghai in October. The Evoque has seen "steady" sales since production began four weeks ago, according to Bob Grace, who heads the automaker's China operations. The Landwind X7 may start sales around July or August at about 150,000 yuan ($24,189), according to Landwind's website. That compares with the starting price of 448,000 yuan for an Evoque, according to Land Rover's website. Calls to Jiangling's main line went unanswered. At the Jiangling stand at the Shanghai show, staff handed out four-page brochures outlining specifications for the Landwind X7. "Imported car? No, China car,” read the tagline on one page of the brochure.